This morning, two colleagues and I gave a press conference on our medical marijuana bills. I was joined by the families of Tommy Elder (age 22) and Haley Smith (age 14) as well as the supporters of Virginia Parents for Medical Marijuana. Tommy Elder and Haley Smith have both suffered from severe epilepsy episodes since infancy. Their parents have found that cannabis oil dramatically reduces the number of seizures they have and helps them cognitively function much better. 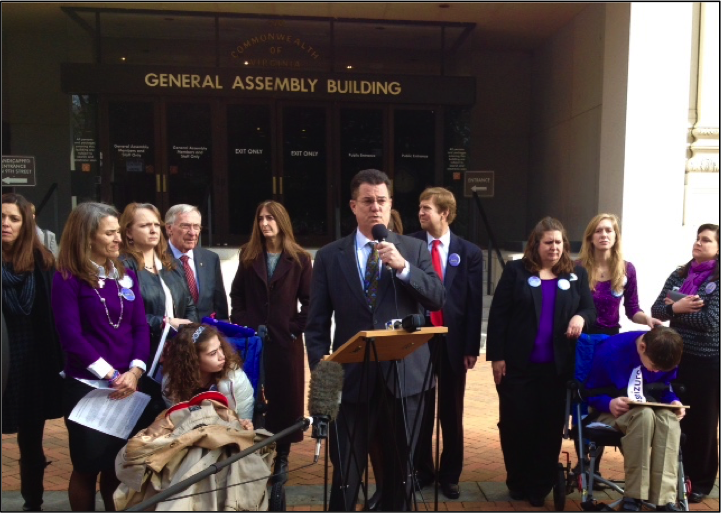 HB 1445 Possession or distribution of marijuana for medical purposes; epilepsy. Allows a person to possess marijuana or tetrahydrocannabinol and allows a medical doctor or pharmacist to distribute such substances without being subject to prosecution if a doctor determines in the course of his professional practice that such substances should be used for the treatment of the person’s epilepsy. Currently, the use of medical marijuana is allowed only for the treatment of cancer and glaucoma. The bill also provides that a valid recommendation from a medical doctor that medical marijuana be used for treatment is a necessary prerequisite for the immunity from prosecution for the possession or distribution of such substances to apply. The current law requires a valid prescription from a medical doctor. The bill also clarifies that the penalties for forging or altering a recommendation for medical marijuana or for making or uttering a false or forged recommendation are the same as the penalties for committing the same acts with regard to prescriptions. I want to emphasize that I am NOT trying to legalize marijuana. Rather, I am trying to find a way to help these kids with their ongoing seizures. This entry was posted in 2015 Session, HB 1445, Health, Medical Marijuana and tagged bill. Bookmark the permalink. I support this bill. Good luck.